This entry was posted on February 5, 2017 by Mari. 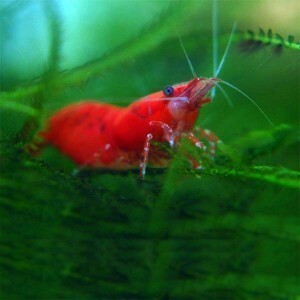 Red Cherry shrimp are probably the most popular dwarf shrimp in the aquarium hobby. They are decorative, undemanding and breed easily: everything a (new) shrimp keeper could wish for. Keep reading for everything you need to know about Red Cherry shrimp care and keeping Red Cherry shrimp in your own aquarium! As with all dwarf shrimp, a large aquarium is not needed to keep Red Cherries and a setup of at least 5 gallons (19L) should be more than enough to sustain a colony. Some aquarists choose to keep them in even smaller tanks, but these will be a lot more difficult to keep stable and are less suitable for beginners. All aquariums, including Red Cherry shrimp tanks, should be filtered and cycled. A sponge filter or a regular filter with a pre-filter sponge is recommended for when keeping dwarf shrimp, as their fry are very small and can easily get sucked up by powerful filters. A heater is usually not a necessity if the setup is located in a heated room, although you can choose to go for one if you want to make sure the temperature remains stable. All shrimp will feel safest (and thus display bright coloration and behave naturally) when plenty of hiding places are present in their aquarium. This can be anything from live plants to special shrimp tubes. As mentioned earlier Red Cherry shrimp, especially the lower and less heavily selectively bred grades, are not too demanding when it comes to water quality and will do well in a wide range of water parameters. Just be sure to never introduce them into an uncycled tank, as they are very sensitive to ammonia and nitrites, and keep water values as stable as possible. Water quality can be tested using a liquid test kit; test regularly to make sure everything is still in order. Be sure to do regular water changes to keep nitrates in check. Red Cherry shrimp, like other dwarf shrimp, are very peaceful and vulnerable. They will never harm any tankmates but will easily fall prey to hungry fish. If you keep higher and more expensive grades it might be a good idea to set up a single species aquarium, though peaceful inverts like other shrimp and small snails are always a possibility. Aquarists who keep lower grade Red Cherry shrimp and don't mind losing some of their stock can keep them with some peaceful tankmates. The shrimp should usually breed quickly enough to sustain the population despite regular casualties provided there are enough hiding places. In the wild, the Red Cherry shrimp's ancestor will eat anything it can find; its diet consists mostly of algae and aufwuchs. In the aquarium Red Cherries will also feed on algae and the tiny organisms living in plants and other organic material, but their diet will usually have to be supplemented. A high-quality shrimp food can be used as a staple. They will also accept blanched vegetables, frozen foods and all kinds of sinking fish foods. 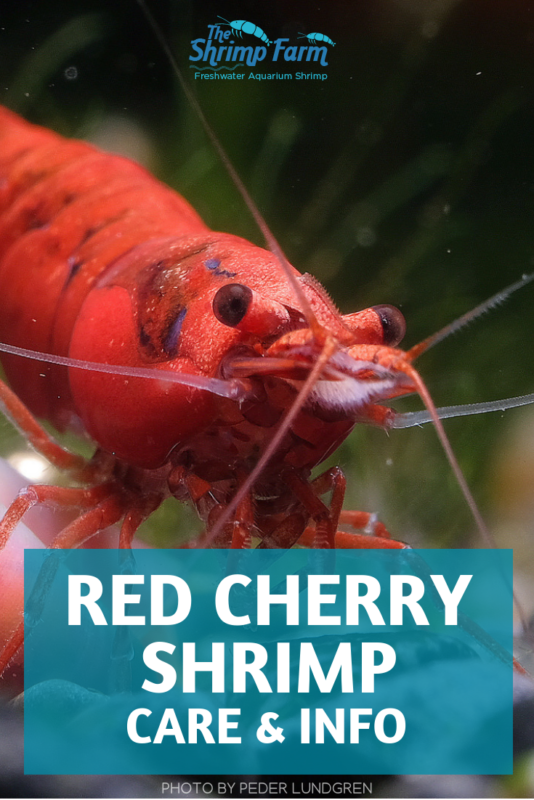 More information about Red Cherry shrimp diet and what to feed your Red Cherries can be found here. Breeding Red Cherry shrimp is not considered difficult at all, which makes them a great option for beginners looking to try their hand at shrimp breeding. As long as water parameters are in order the shrimp will reproduce readily, with females carrying eggs pretty much all the time. More information about breeding Red Cherry shrimp can be found here. Red Cherry shrimp were selectively bred from shrimp with a brownish color. Breeders are always working to produce shrimp with even an even more intense reds, which has lead to a number of different grades being established in order to be able to assess a shrimp's "quality". 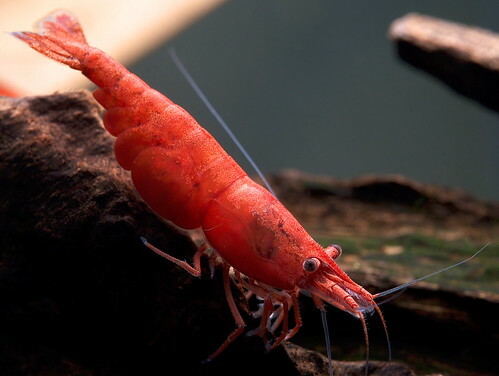 The more opaque and intense the red coloration, the higher the grade the shrimp will fall into. A full article about the different Red Cherry shrimp grades with a handy grading chart can be found here. You should be able find Red Cherry shrimp in most aquarium stores, although quality can vary. The Shrimp Farm sells both low grade and high grade Red Cherry shrimp - delivered right to your doorstep with guaranteed live arrival.